The CHOICE CDC300 Series, a non-regenerative D.C. motor controller, provides a full range of speed or torque control for 5-150 HP D.C. motors rated for NEMA type “D” power. Five standard models are offered in a compact panel mount assembly. Each model is customer connectible for operation at 230 VAC or 460 VAC three phase input. When operated with 230 VAC input, each unit supplies variable armature voltage up to 240 VDC and a fixed field supply of 150 VDC. For operation with 460 VAC input, each model supplies up to 500 VDC for armature voltage and a fixed field supply of 300 VDC. Each CHOICE model is designed for maximum flexibility and ease of installation. Fuses are supplied for A.C. line protection, auxiliary line fuses for optional equipment, fuse protection for the 115 VAC control voltage input, and fusing for the field circuit. Standard relay logic interfaces separately supplied operators for Emergency Stop, Ramp Stop, Run Forward, Run Reverse, Jog Forward, and Jog Reverse when the unit is operated with a separately supplied Forward armature contactor and a separately supplied Reverse armature contactor. A complete line of options are available. An accessory drive circuit monitor, Model DCM 100-000, is available to assist in set-up and troubleshooting by plugging into the control board to easily access 20 separate signals. 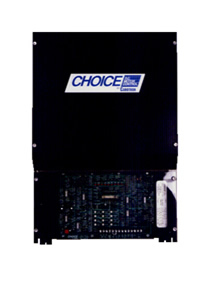 Loaded with standard features, the Carotron CHOICE D.C. motor controller offers an innovative, economical solution to your variable speed or variable torque control requirements.